This set includes 21 color images and 20 black and white images. 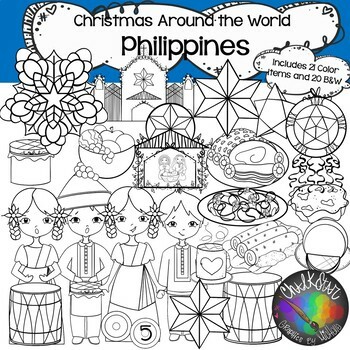 ❥This adorable set will brighten up your Holiday resources. All images are 300 dpi and and come in PNG format with transparent backgrounds so the lines stay crisp and can easily be layered into your creations. The images are bundled into a zip file. Please be sure you have a program to open this type of file. ❥Ok for digital use! Permission granted for use in digital products. Images may be used as digital parts without text embedded on them. Please give credit to Chalkstar Graphics when you use these graphics commercially. These graphics are created by Michelle and may not be sold as-is or given freely by themselves or with other clipart, but you may use them in your personal resources or embed them in the teaching resources that you create to sell. ❥I love hearing your feedback, comments and requests. Don't miss out on freebies, flash sales and more! Follow Chalkstar onFacebookandInstagramfor flash freebies and giveaways. 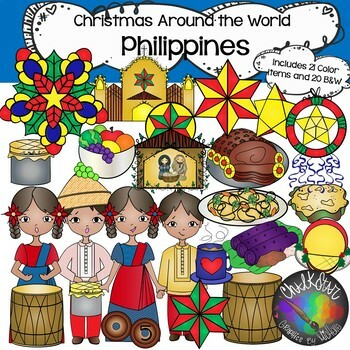 Keywords: Christmas Clip Art, Holidays Around the World, Traditions.